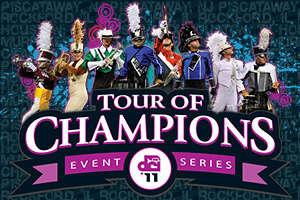 Fans of drum corps throughout North America will be treated to five unique events this summer when the new Tour of Champions event series is launched as part of the 115-event 2011 Drum Corps International Tour. The event series will provide fans with up-close, exclusive access to the corps performers and to exciting live entertainment like never before. Audience members get to see for themselves the backstage and warm-up secrets of some of DCI's top corps just minutes before they take the field in competition. Exciting pre-show entertainment showcasing outstanding performers from each of the participating corps. "Instant Encores" by each group that will bring the action as up-close and in-your-face as it gets. Special post-show activities to delight fans old and new, including a spectacular finale at each event. Audience members will play a role in the adjudication process with an all-new, experimental text messaging-based judging system designed with the fan in mind. This series kicks off on July 17 in Rockford, Ill., continuing on to Houston, Texas, July 22; Murfreesboro, Tenn., July 29; Charlotte, N.C., July 31, and culminating at a soon to be announced location in Northern, New Jersey on August 7.